You know, that temporary transition between end of Summer and leading into Fall is always an anxious time for me. Do you ever feel that way between seasons? I get like that also between February and April. I want to decorate full blown come the end of August for the Fall season. But let’s face it, I look like a fool and who can have that?! 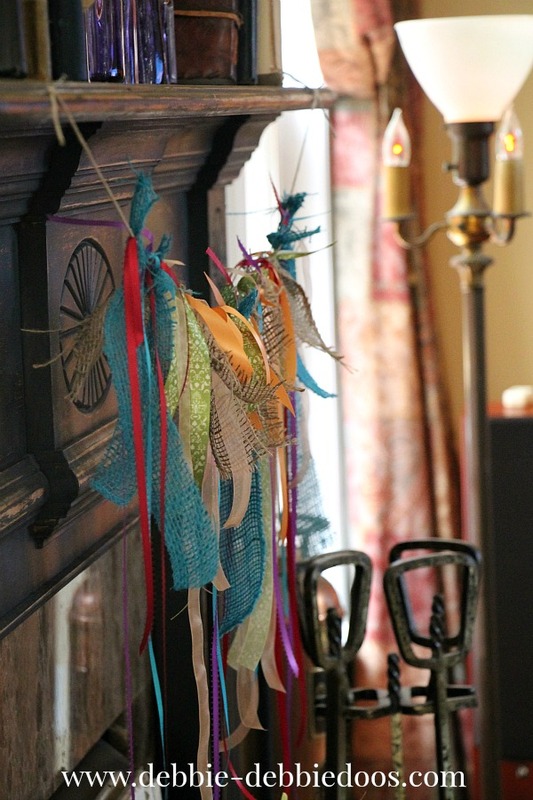 So I thought I would make a ribbon scrap garland for our fireplace to jazz it up with some whimsy and color. 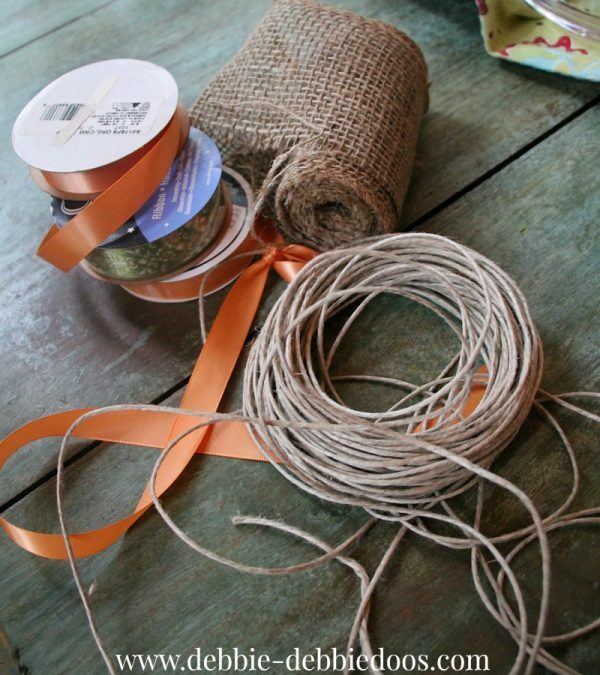 Burlap gallery for more ideas. They are all in there. the other day I shared some history on vintage purple bottles. I wanted my scrap garland to go along with those. I always have a lots of ribbon on hand. I love to tie it around vases, mason jars, candles, whatever I can find to dress them up. I used simple twine as the garland. It is light and easy to tie fabric or ribbon around. I wanted my garland to look a bit more shabby and rag like. Sort of like I did my burlap rag wreath last year. Nothing too refined or perfect. The colors were perfect because I have just about every color in our family room. Not sure what the hubs thinks of it. But then again, he knows it won’t be up for very long. Just about a month or so. There really is no tutorial. You simply cut your ribbon in all different lengths and tie the end around the twine in a knot. I added burlap scraps as well that I cut in strips. That’s about all for today! and that’s how you make ribbon scrap garland. By the way, I was totally inspired to make this after seeing my blogging friend Shannon make a bunch for an upcoming Market she is in. You can check out her vintage garlands as well. She made a bunch. It’s the whole big picture that I love! 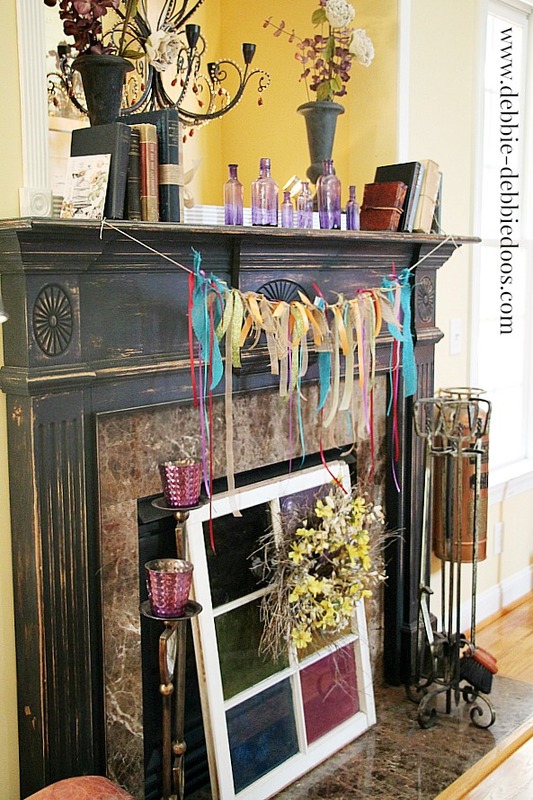 The way the fireplace looks with your glass bottles (STILL need to try that, btw.) and the window and the black mantel piece is all just fabulous. I can’t think of the word to describe it. Whimsical isn’t quite enough. I’m soooo ready for fall! It’s my favorite season! I’m trying to do some refreshing here too to tide me over! 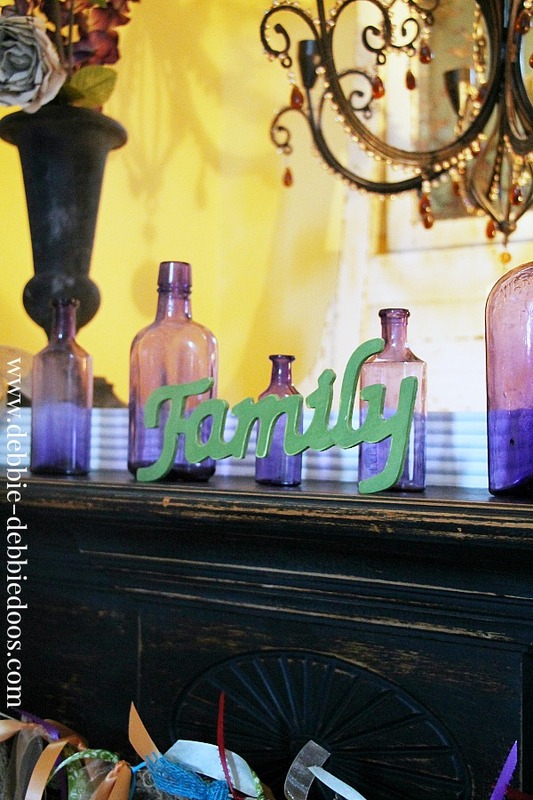 Your mantel looks fab! How festive looking Debbie, and yes it’s hard to decorate and find things to write about when we are between season. It drives me crazy that in between time! I love it, Debbie. I may try that myself. I love this! What a great way to make use of end ribbon bolts and scraps of favorite fabrics. BTW your photos are beautiful! Thanks Ann! I am working on better photos. You would think after 5 years I get it..but I don’t LOL! Love it all! The garland is adorable! I so need to do this as I have all sorts of scraps like this. Your fireplace and mantle piece is just darling! That’s a nice little simple touch! Looks great! Thanks Patty! It really is the simple things that make me smile. Then you certainly can whip one of these up. 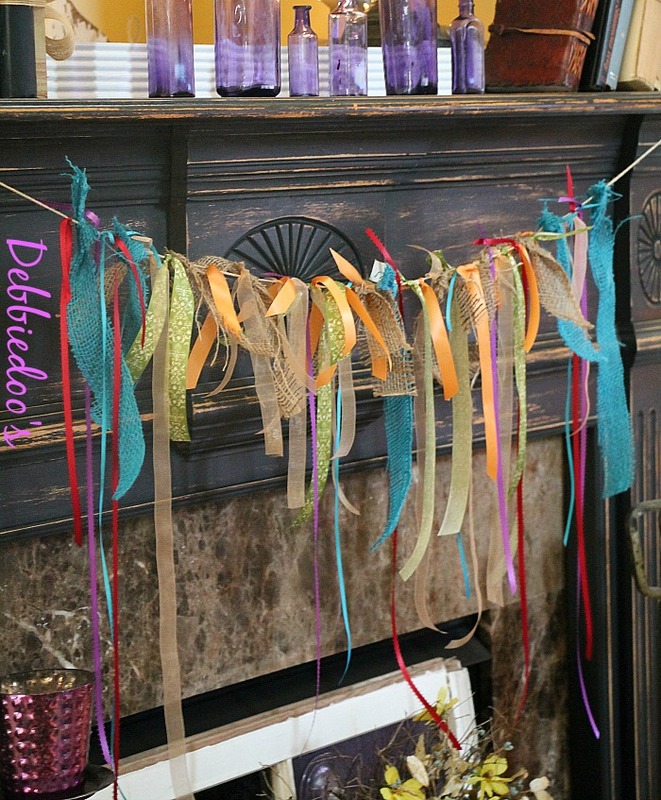 Love the garland Debbie…..I love that you used fabulous colorful ribbons and burlap….I have seen them in strips of fabric, but love that you used the ribbon…your personality shines through in the ribbon garland/banner…such a happy one!!! I love it! 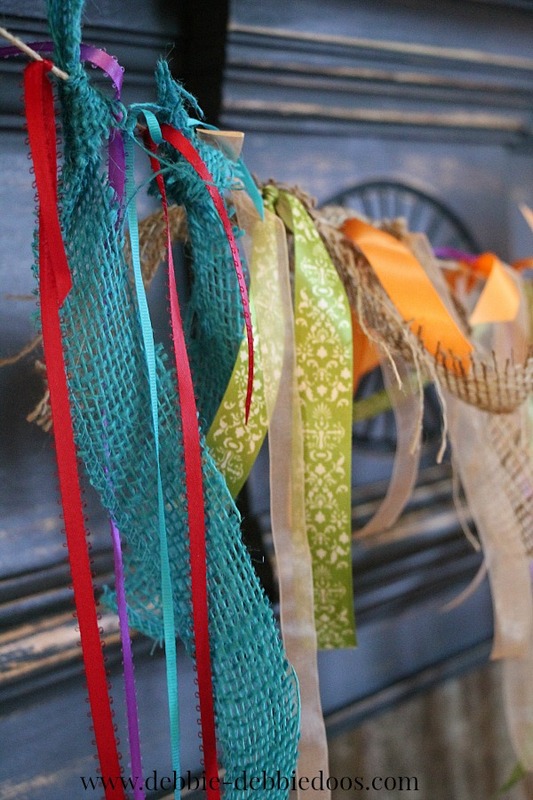 You “imperfect” garland looks, well, perfect!